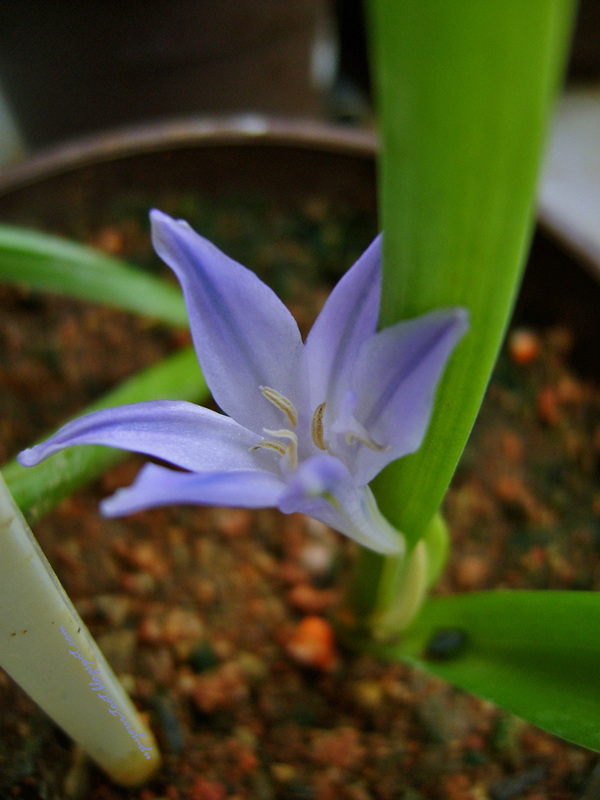 The Triteleia laxa ‘King Fabiola’ surprised me today when I turned one of the pots around to see how they are doing. These corms that I have procured from Diana (Kebun Bahagia Bersama) and planted in pots had been placed between the other planter boxes as the leaves are droopy and not at all attractive. In past month, some of the plants have already begun to lose their leaves, indicating that they are coming to the end of the season. They are known to flower either leafless or when they start to lose their leaves. The triplet lily Triteleia laxa King Fabiola - the poor thing is stunted, more like a Dwarf Fabiola. The blue colour is very pretty and I wouldn't mind a garden covered with little blue flowers like this. 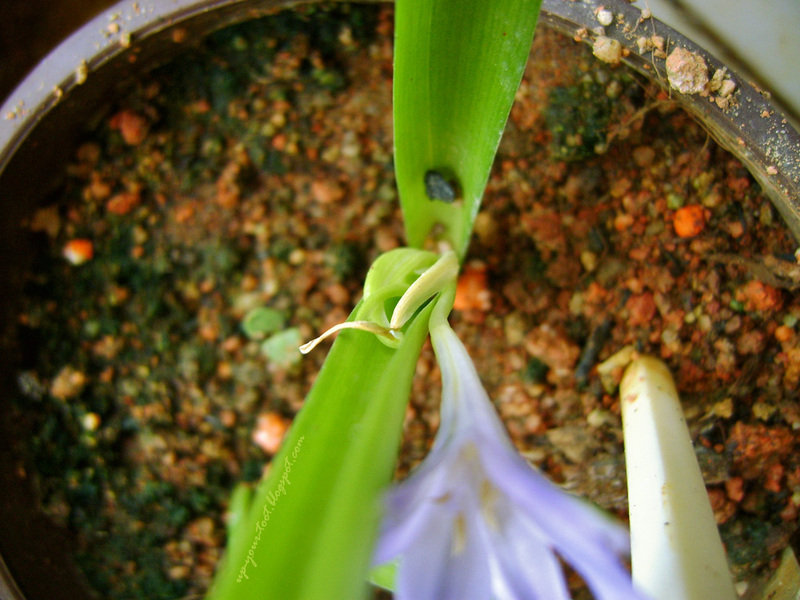 Thinking that the flower stalks would be long and hence would be noticeable when they do bloom, I have paid little attention to them (click here for a post when the leaves first emerged). Also, I paid little attention to them in terms of feeding, since in the wild, they are supposed to be weeds. The name grassnut tells you a lot about the plant's behaviour in the wild. Alas, I spotted a pretty blue flower, not on an umbel at the end of a long inflorescence, but just a few centimetres above the soil level. The lilac-blue colour is indeed very pretty. A check on the other pot that had became leafless indicate that flowers could have possibly came and gone unnoticed, as I have the pot sandwiched between a pot of lavender and the kai lan. The somewhat distorted/stunted inflorescence of my King Fabiola - probably due to neglect and weather conditions. They supposed to be long and bear an umbel of blue flowers. The flower of the triplet lily, also known as Ithuriel's spear, has parts that come in threes - three sepal and three petals. Besides the pretty blue flowers, the corms are edible and supposedly taste like potatoes, though I am not willing to kill a corm and try. Perhaps I should have gotten more King Fabiola corms in the first place. Err, Diana, any more King Fabiola corms??? Indeed very beautiful blue..tak nampak the lilac part..kalau diana ada lagi akak pun nak..
Kat bahagian dalam bunga tu. But depends on the light. I mungkin sudah miss the flowers of the other pot - macam ada bunga layu je. I pakai siram je tapi tak pergi belek pokok tu. How long do you reckon the flower bloom? My cousin told me some of the small flower bulb did bloom but I was not sure which. Guessing small bulb would probably be ixia or sparaxis. Oh like the King fabiola bloom colour very rare. Approximate 3 months from planting to bloom? King fabiola dah tak de tapi queen fabiola maybe ada. Planted at the end of June, so approximately 3 mths, yes. Sparaxis dan Ixia saya belum bunga lagi juga. The hot weather stalled their growth. Now as the weather gets cooler, they are putting out more leaves. Queen Fabiola boleh juga.